Star trails over the Kannally Ranch House at Oracle State Park, Arizona. Photo by Mike Weasner. 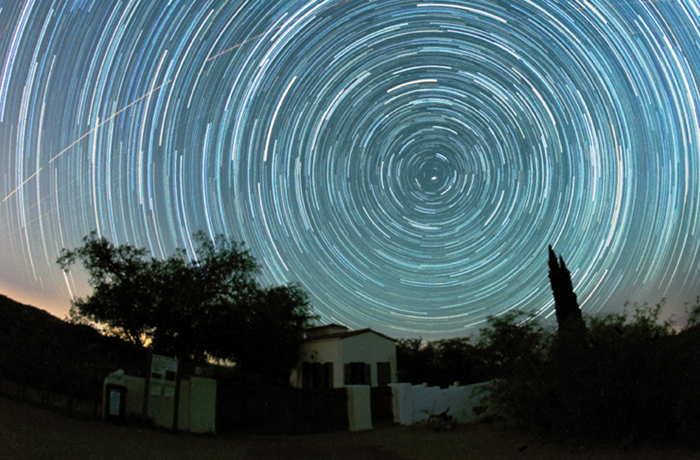 TUCSON, Ariz., and ORACLE, Ariz. 12 November 2014 — Nestled between the bright cities of Phoenix and Tucson, Oracle State Park Center for Environmental Education is a dark sky oasis in the desert. Now the park’s impressive night skies will be protected for future generations. The International Dark-Sky Association is honored to name Oracle State Park an International Dark Sky Park. The prestigious designation is the result of exceptional efforts to protect the area’s dark skies and raise public awareness about the issue. Designated at the “Silver” tier level, the park is the first in the Arizona State Park system to receive IDA recognition. Encompassing 3,948 acres (1,598 hectares) of land, the park is located in the northeastern foothills of the Santa Catalina Mountains in Pinal County, Arizona. It takes its name from the nearby, unincorporated community of Oracle, which was founded by prospectors in the 1870s. At an elevation of 4,500 feet (1,370 meters), the park offers summertime relief from the intense heat of the desert floor below. Park visitors enjoy hiking, wildlife observing, and a variety of nature education programs. Today’s designation owes much to the efforts of the Oracle Dark Skies Committee (ODSC), whose members include Oracle-area residents, members of the Friends of Oracle State Park, and State Park Rangers. Michael Weasner, a retired former U.S. Air Force pilot and aerospace industry manager, chairs the group and spearheaded the effort to obtain the IDA recognition. Illinois brothers Neil and Lee Kannally purchased the original 160-acre (65-hectare) ranch in 1903. Neil Kannally left Illinois the year before, settling in the Oracle area to become a ranch hand. He believed Arizona’s dry desert air would help with his tuberculosis. In 1905, Lee, their two sisters and a brother joined Neil and settled on the ranch. Over the following decades, land purchases expanded the ranch to over 50,000 acres (20,000 hectares). The Kannallys built a Spanish colonial-style ranch house in 1932 that remains the focal point of the property. All five of the siblings lived on the ranch for the rest of their lives and occupied the ranch house until the death of the youngest sister Lucile in 1976. Most of the ranch land was sold to the Magma Copper Company in 1952, leaving an area of about 4,000 acres (1,600 hectares) that Lucile Kannally willed to Defenders of Wildlife, a nonprofit dedicated to preserving animals and plants native to North America. In 1985, the Defenders transferred the house and ranch land to the State of Arizona with the goal of founding a new state park. For several years while closed to the public, the park offered environmental education trail programs for visiting school groups. In 2001, after a lengthy process, Oracle State Park was named a state park and opened to the public with the dual mission of serving as a wildlife refuge and environmental education center. “The International Dark Sky Park ‘Silver’ designation fits extremely well with the mission and goals of Oracle State Park as a Center for Environmental Education,” said Steve Haas, Park Manager. The park is only about 20 miles (32 km) from Tucson, a city of nearly one million people. Despite its proximity to the city, the park is fortunate that the Santa Catalina Mountains screen out much of the glow of the city’s lights. This puts an authentic dark-sky experience within an hour’s drive for hundreds of thousands of people in southern Arizona. Protection of Oracle State Park’s dark skies is enhanced by park policies and restrictive outdoor lighting ordinances in Pinal and Pima Counties, and in Tucson itself. The park has attracted increasing interest from casual stargazers and the area amateur astronomy community. In support of its application for IDA recognition submitted by ODSC, the group held a number of events at the park to bring visitors together with telescopes to experience firsthand the wonders of the night sky. One such event, held in late June, attracted more than 350 visitors, some of whom traveled from as far away as Phoenix. Arizona State Parks plans to give high priority to dark skies at its 30 state parks and natural areas, applying lessons learned in the Oracle application toward the goal of achieving many more IDA designations in Arizona. IDA’s application process for International Dark Sky Park certification includes elements such as adoption of park policies that control the amount and type of outdoor lighting allowed on the property. To simplify the application process for other Arizona state parks, Oracle’s lighting plan is being adapted for use throughout the state park system. “Arizona State Parks’ conservation efforts are an important part of the agency’s mission. We are excited to have Oracle State Park designated as a dark sky park and hope to see many more parks added,” Arizona State Parks Director Bryan Martyn said. Arizona’s state and national park dark sky conservation programs add economic, ecological and educational value to both rural and urban communities alike, drawing higher levels of park visitation. Data from other IDA International Dark Sky Parks suggest that neighboring communities gain tangible economic benefits from the added tourist visibility. The partnership between IDA and Arizona State Parks is expected to help improve the long-term financial prospects of many rural State Parks properties. Finally, strong support for dark-skies conservation presents an important opportunity to advance education and public outreach in Arizona according to Dr. Bob Casavant, the Arizona State Parks Manager of Natural Resources, Science, and Research. “Prudent and committed community partnerships continue to assist Arizona State Parks and other resource management agencies in advancing conservation of Arizona’s truly world-renowned night skies, and related successful STEM (science, technology, engineering, math) programs across the state,” Casavant said. IDA established the International Dark Sky Places conservation program in 2001 to recognize excellent stewardship of the night sky. Designations are based on stringent outdoor lighting standards and innovative community outreach. Since the program began, eight Communities, 20 Parks and nine Reserves have received International Dark Sky designations. For more information about the International Dark Sky Places Program, visit https://www.darksky.org/international-dark-sky-places/about-ids-places. The International Dark Sky Association, a 501(c)(3) non-profit organization based in Tucson, Arizona, advocates for the protection of the nighttime environment and dark night skies by educating policymakers and the public about night sky conservation and promoting environmentally responsible outdoor lighting. More information about IDA and its mission may be found at https://www.darksky.org.